Johnny Galivan has an unorthodox method when it comes to recording an album – a method that he doesn’t exactly have a fondness for. He has a tendency of getting sick when it’s time to get in the studio. The recording process for his band Chasing Safety’s latest record, Nomad, was no exception. A great deal of musicians discuss the positives when recording an album but don’t always share the challenges. For Chasing Safety, it was almost effortless this time around because of their individual experiences leading up to the recording of Nomad. However, that didn’t make the process any less stressful. “I don’t think I’ve ever really recorded an album with a healthy voice, I’ve always been hurt in some fashion… at least I’m consistent, right?” Galivan joked. Despite the vocalist losing his voice for a period of time, it was nothing short of a great experience. “What stood out about this time around is I actually did have the most fun out of any studio experience I’ve ever had,” Galivan said. The title Nomad came first, as the band wanted to have a theme set in stone before contributing lyrics. The concept came to Galivan one day while he was driving and after pitching it to the rest of the band, step one was complete. 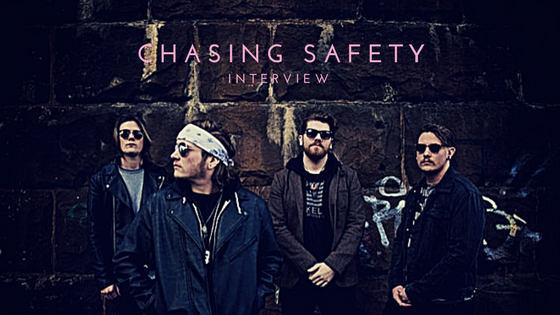 Rather than coming up with a title after creating the music, Chasing Safety worked in reverse. A nomad, or a wanderer, is an independent entity that they wanted the lyrics to scratch the surface of. Each song on the record reflects that concept and works it into multiple meanings. For Johnny, this record was all about writing for personal reasons and not playing into what other people may think or want to hear. Stressing about writing music for others is where bands can stray from the path. By writing songs that mean something to the writer creates that raw emotion that can never be replicated quite the same. Nonetheless, the songs of Nomad can still be translated beyond Galivan's personal stories. “I wrote lyrics broad enough to where another listener can come and relate it to something that they were thinking or feeling or were going through their heads. Anybody can take one of the songs and make it one of their songs while still writing it for me,” he said. If the record itself isn’t enough evidence of their hard work, there’s also the behind-the-scenes footage from their time in the studio. They captured everything from day one and beyond, and have been sharing the webisodes with their fans during the lead up to and release of the record. From the first day where they wrote “Brand New Prison” to the very last moment of recording, the band really dived into what they wanted to say and brought together a record that was important to each of them.